Abstract: The aim of this study is to determine the relationship between parental style and internet parental style and find out whether student's parental style and parental internet style differ according to various variables. In this study, survey model was used. The study was performed with 296 students, attending at an elementary school in the second period of 2011-2012 academic years in Sakarya, Turkey. Parental style and parental internet style scales were used. Results indicated that there is a significant relationship between students' parental style and their family's parental internet style. It was also found that students' gender is a significant variable in their parental style and parental internet style. Moreover, it was determined that there is a significant relationship between students' family's parental internet style and their grade at school. Keywords: Parental style, Parental internet style, Gender, Grade, Internet use. Aksüt, M.; Özer, İ.; Gündüz, A. & Kaşıkcı, P. (2008, Şubat). İlköğretim öğrencilerinin internetten yararlanmalarına ilişkin Anne-Baba tutumlarının değerlendirilmesi. Akademik Bilişim konferansı, Çanakkale Onsekiz Mart Üniversitesi, Çanakkale, 30 Ocak - 01 Şubat 2008. pp: 475-479. Anderson, C. A. & Bushman, B. J. (2001). Effects of violent video games on aggressive behaviour, aggressive cognition, aggressive affect, physiological arousal, and prosocial behaviour: A meta-analysis of the scientific literature. Psychosocial Science, 12, 353-359. Cao, F. & Su, L. (2006). Internet addiction among Chinese adolescents: Prevalence and psychological features. Child: Care, Health and Development, 33(3), 275–281. Caplan, S. E. (2002). Problematic Internet use and psychosocial well-being: Development of a theory- based cognitive–behavioral measurement instrument. Computers in Human Behavior, 18, 553-575. Çevik, B. G. & Çelikkaleli, Ö. (2010) Ergenlerin arkadaş bağlılığı ve internet bağımlılığının cinsiyet, ebeveyn tutumu ve anne baba eğitim düzeylerine göre incelenmesi. Ç.Ü. Sosyal Bilimler Enstitüsü Dergisi, 19(3), 225-240. Giles, G. & Price, I. R. (2008). Adolescent computer use: Approach, avoidance, and parental control. Australian Journal of Psychology, 60(2), 63–71. Horzum, M. B. & Bektaş, M. (2014). Examining the ınternet use aim and ınternet parental style of primary school students in terms of various variables. Croatian Journal of Education, 16(3). Hsu, Y. H. (2005). A Study on the network usage and network literacy of fifth and sixth graders in remote areas of Taipei country. Unpublished master’s thesis, National Taipei University of Education, Taipei, Taiwan. Huang, R. L., Lu, Z., Liu, J. J., You, Y. M., Pan, Z. Q., Wei, Z., He, Q. & Wang, Z. Z. (2009). Features and predictors of problematic internet use in Chinese college students. Behaviour & Information Technology, 28(5), 485-490. Jeong, E. J. & Hwan Kim, D. (2011). Social activities, self-efficacy, game attitudes, and game addiction. Cyberpsychology, Behavior, and Social Networking, 14(4), 213-221. Jones, P. J. (2006). Resources for promoting online citizenship. Educational Leadership, 63(4), 41. Ko, C. H., Yen, J. Y., Yen, C. F., Chen, C. S., Weng, C. C. & Chen, C. C. (2008). The association between ınternet addiction and problematic alcohol use in adolescents: The problem behavior model. Cyber Psychology & Behavior,11(5), 571-576. Lamborn, S., Mounts, N., Steinberg, L., & Dornbusch,S. (1991). Patterns of competence and adjustment among adolescents from authoritative,authoritarian, indulgent, and neglectful homes. Child Development, 62, 1049-1065. Lin, C. H., Lin, S. L., & Wu, C. P. (2009). The effects of parental monitoring and leisure boredom on adolescents' Internet addiction. Adolescence, 44(176), 993-1004. Lim, J., Bae, Y., & Kim, S. (2004). A learning system for internet addiction prevention. Proceedings of the IEEE International Conference on Advanced Learning Technologies (ICALT’04). http://portal.acm.org/citation.cfm?id=1018423.1020135 adresinden 18.03.2014 tarihinde erişilmiştir. Mesch, G. S. (2003). The family and the internet: The Israeli case. Social Science Quarterly, 84(4), 1038-1050. Moazedian, A., Taqavi, S. A., Hosseini Almadani, S. A., Mohammadyfar, M. A. & Sabetimani, M. (2014). Comparison effectiveness of cognitive - behavioral therapy and metacognitive therapy on improvement of body-image among university students with social phobia. Journal of Life Science Biomedicine, 4(1), 9-14. Şahin, F. T. & Kalburan, N. C. (2009). Aile eğitim programları ve etkililiği: Dünyada neler uygulanıyor? Pamukkale Üniversitesi Eğitim Fakültesi Dergisi, 1(25), 1–12. Valcke, M., Bonte, S., De Wever, B. & Rots, I. (2010) Internet parenting styles and the impact on Internet use of primary school children. Computers & Education, 55, 454-464. Van den Eijnden, R. J. J. M., Spijkerman, R., Vermulst, A. A., Van Rooij, A. J., & Engels, R. C. M. E. (2010). Compulsive Internet Use Among Adolescents: Bidirectional Parent–Child Relationships. Journal of Abnormal Child Psychology, 38(1), 77-89. Van Rooij, T. & van den Eijden, R. (2007). Monitor Internet en Jongeren 2006 en 2007: Ontwikkelingen in internetgebruik en de rol van opvoeding. http://www.ivo.nl/UserFiles/File/Publicaties/2007-10%20IVO%20Reeks %2054%20-%20Monitor%20Internet%20en%20Jongeren%202006%20en% 202007.pdf adresinden 18 Agustos 2012 tarihinde erişilmiştir. Wang, R., Bianchi, S. M. & Raley, S. B. (2005). Teenagers’ Internet use and family rules: A research note. Journal of Marriage and Family, 67(5), 1249-1258. Xiuqin. H., Huimin, Z., Mengchen, L., Jinan, W., Ying, Z. & Ran, T. (2010). Mental health, personality, and parental rearing styles of adolescents with ınternet addiction disorder. Cyberpsychology, Behavior, and Social Networking, 13(4), 401-406. Yang, C. K., Choe, B. M., Baity, M., Lee, J. H. & Cho, J. S. (2005). SCL 90-R and 16PF profiles of senior high school students with excessive internet use. Canadian Journal of Psychiatry, 50(7), 407-414. Yen, T. H. (2002). Research on The Relationship between background, behavior of using Internet and psychological characteristics for elementary school students. Unpublished master’s thesis. University of Tainan, Tainan, Taiwan. Yılmaz, A. (2000). Eşler arasındaki uyum ve çocuğun algıladığı anne-baba tutumu ile çocukların, ergenlerin, gençlerin akademik başarıları ve benlik algıları arasındaki ilişkiler. Yayınlanmamış Doktora Tezi, Hacettepe Üniversitesi, Sosyal Bilimler Enstitüsü, Ankara. Young, K. S. (2004). Internet addiction: A new clinical phenomenon and its consequences. American Behavioral Scientist, 48(4), 402-415. ISNAD Deniz, Metin , Horzum, Mehmet Barış , Ayas, Tuncay , Koç, Mustafa . "An Examination of Elementary School Students' Parental Style and Parental Internet Style with Respect to Various Variables". 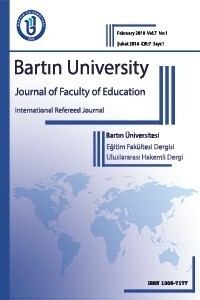 Bartın University Journal of Faculty of Education 5 / 3 (October 2016): 879-892.